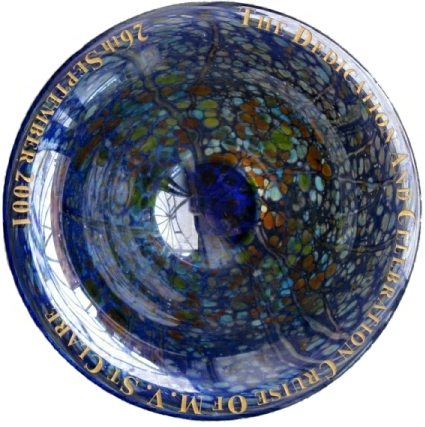 Many commemorative pieces were commissioned over the years with Isle of Wight Studio Glass. It is not currently known to this site when the first one was made or who the designers were. However, when information becomes available the pieces will be listed here in approximate date order. 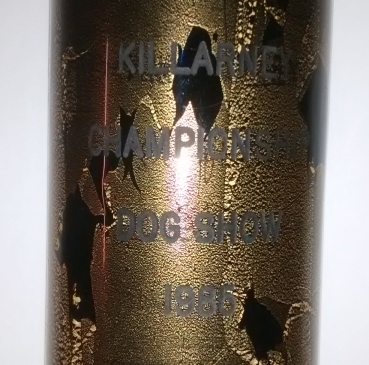 This piece consists of a gold Azurene cylinder vase, 15.5 cm high x 6 cm diameter, with the text saying "KILLARNEY CHAMPIONSHIP DOG SHOW 1985" sandblasted on the side. Presumably it was a prize at the show. 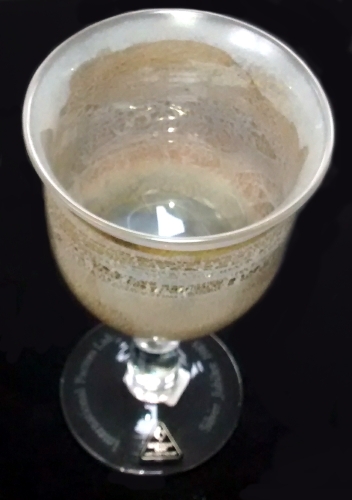 This piece is a 'White' Azurene drinking goblet, about 15 cm high, where the colourless foot has a commemorative engraving saying 'International Factors Ltd Silver Jubilee 1985'. Flattened globe paperweight about 5.5 cm diameter and 3.8 cm high. On the base it says "Our Lady Patricia Inaugural Voyage 26th March 1986". HSC Our Lady Patricia was a catamaran ferry on the Ryde Pier to Portsmouth route operated by Wightlink. The logo is that of Sealink Stena Line. 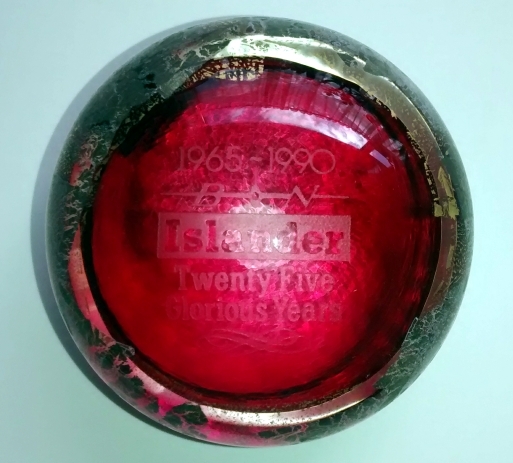 A flattened globe paperweight, 7 cm diameter, 3.5 cm high, similar to pink Azurene, with the words "1965-1990 B N Islander Twenty Five Glorious Years". 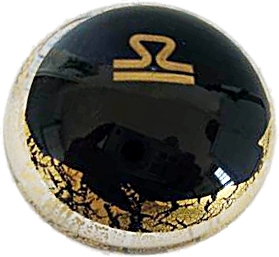 Although the commemoration refers to 1990 there is a gold on black square label on the base which indicates the paperweight was probably made in 1991. The Islander reference is to the Britten-Norman Islander aircraft. A footed bowl in the style of Nightscape, about 19 cm in diameter and 11.5 cm high. 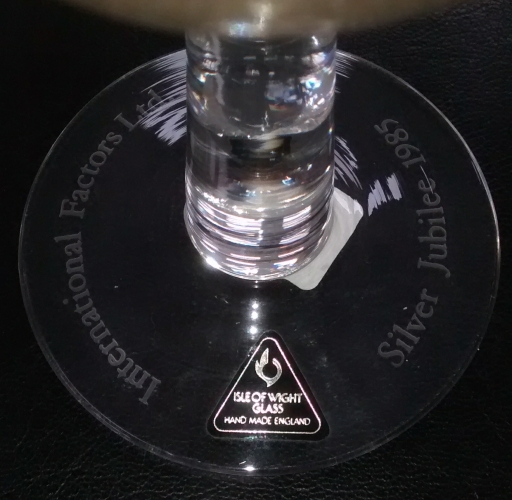 The words engraved on the rim say "Opening of Vantage West for Consolidated Financial Insurance by HRH Prince Edward on the 16th February 1996." It was made in a limited edition of 50. They were signed "Jonathan Harris Isle of Wight Glass" and numbered. 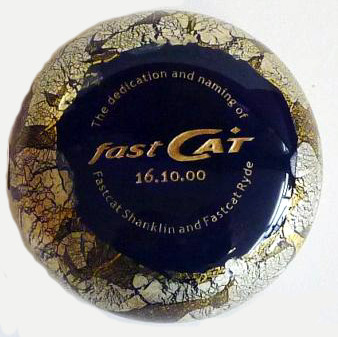 A flattened paperweight with the words "The dedication and naming of fastCAT 16.10.00 Fastcat Shanklin and Fastcat Ryde." HSC FastCat Shanklin and HSC FastCat Ryde were high speed catamaran ferries which operated between Ryde Pier to Portsmouth from August 2000 to 2010. A footed bowl, 14 cm diameter at the rim, 7 cm high, with colours similar to Summer Fruits Mulberry. 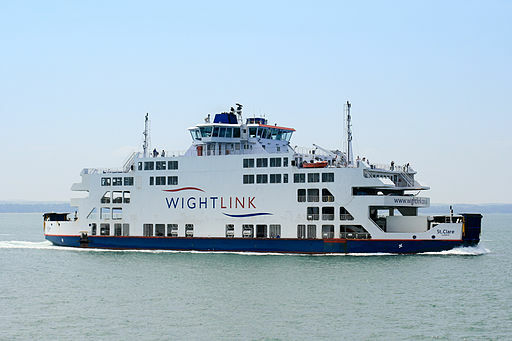 The MV St Clare is a ship currently sailing on the Portsmouth to Fishbourne, Isle of Wight, route operated by Wightlink. Image courtesy of Brian Burnell. A footed bowl, 15.5 cm diameter at the rim, 9 cm high, with colours similar to Summer Fruits Mulberry. The first Flame of Hope Awards ceremony took place in 2003. Since then Cancer Research UK has presented over 500 Flame of Hope awards to thank and recognize individuals who have given significantly in the cause to beat cancer. 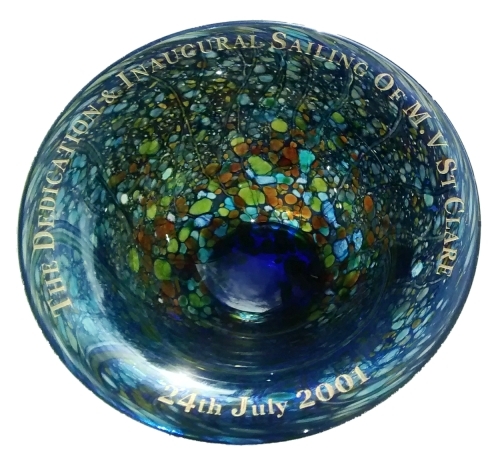 There is a story in the Morpeth Herald in July 2006 mentioning that the award that year was a drop-shaped paperweight made by IOWSG. This item seems to be it. 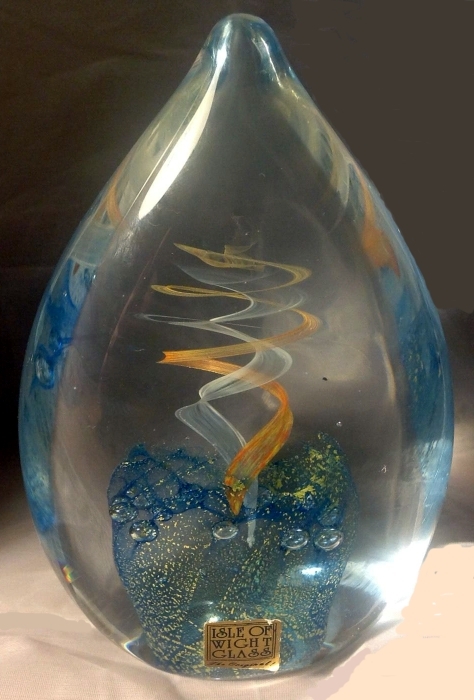 The paperweight has the words "Flame of Hope" etched in gold in large letters on the side. 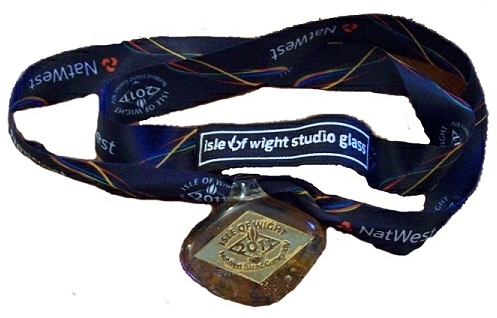 A diamond-shaped pendant, about 6.5 cm wide and 5.0 cm high, with the words "Isle of Wight 2011 NatWest Island Games XIV" on the front and "International Island Games Association Commemorative" on the back. It comes with a blue lanyard with "NatWest" and the NatWest logo and "isle of wight studio glass" with the flame logo substituting for the 'o' of 'of'. The diamond face of the pendant and the lettering on the back are in gold, silver or bronze. In total 1555 were made to present to the winning athletes. A further 265 commemorative medals were presented to dignitaries and officials at the Games. IOWSG worked with Octopus Designs to design the medal. There is an article about the medals on the On The Wight web site.